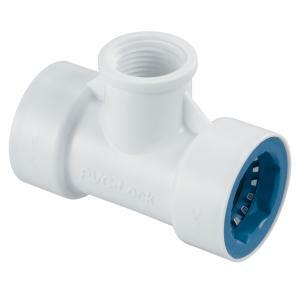 The PVC-Lock combination tee has two PVCL connections and a 1/2" FPT (female pipe thread) connection. Use when you need a threaded connection in a run of PVC pipe. PVC-Lock® is an easy-to-use fitting that will save you time and eliminate the need for messy (and toxic) primer and glue. The PVC-Lock fitting easily pushes on standard PVC pipe, where it locks in place and is ready to use; no glues, no primer, no clamps, no tools or drying time required. Great for repair or installing pvc pipe sprinkler systems. Works in wet or dry conditions.